More than 4.5 million people are bitten by dogs each year in the United States, and more than 800,000 of these require medical attention, according to the Centers for Disease Control (CDC). Nearly half of these bites involve children, and children are far more likely to be severely injured. Most dog bites involving children occur during every day interactions with familiar dogs. In order to raise awareness and focus on the importance of safe human-dog interactions, the second week in April is dedicated to dog bite prevention. Dogs bite for a multitude of reasons. Dogs bite to defend their territory, because they are fearful and startled, and because they feel threatened. They will also bite to protect something they feel is valuable to them (like their puppies, food, toys – or humans). Dogs will also bite when they are ill or injured. The important fact to remember and share with children is that ANY dog can bite: big or small, young or old. It is NOT a dog’s breed that determines whether it will bite, but rather the dog’s history, behavior, and situation. Socialization: Socializing your pet in a safe and appropriate manner will help your dog feel more comfortable in a variety of situations as s/he gets older. It is important for the humans in a dog’s life to educate themselves on how to communicate effectively. We recommend asking for a professional dog trainer to help you learn your dog’s signals about how s/he is feeling and how to respond. It is possible to “over” socialize a puppy and inadvertently cause more stress. It is critical to respect your puppy’s cues and remove him/her from the stressful situation as needed – even when the situation “should” be fun. Socialization at a pace that feels safe and fun for your dog is an important step in reducing his/her fear, anxiety, and stress. Responsible Pet Ownership: Responsible pet ownership starts with selecting a dog that is a good fit for your family and lifestyle, providing proper training, regular exercise, and veterinary care. This also involves choosing situations for your dog that set him/her up for success. It is important to communicate your dog’s needs to others around you. Regular veterinary care provides an opportunity to ensure that your dog feels well and is not experiencing pain. Education: Educate yourself and your children about how – or not – to approach a dog. It is critical that children learn to “listen” to dogs and learn to respect what is being communicated. Teach children a pet’s calming signals including a whale eye, yawn, pant, or lip licking. This is the point at which to leave the dog alone. S/he is exhibiting signs of stress and needs space. If these signs are ignored, the signs escalate to a tucked tail, ears pinned, and cowering position. When these signs are disregarded, the dog is left no choice but to growl, bear teeth, and eventually bite. In some cases, the dog has been “taught” to NOT show calming signals by being told “no” when displaying these behaviors. These dogs are particularly dangerous because they skip all the signs and start with a bite. If you have questions, work with a professional trainer to learn these important signals. When a dog is not with his/her owner. If a dog is with their owner, but the owner has not given permission to pet the dog. When a dog is sleeping or eating. When a dog is with her puppies. When a dog is playing with a toy or chewing a bone. If a dog appears tense and is using calming signals, growling, barking, or showing teeth. 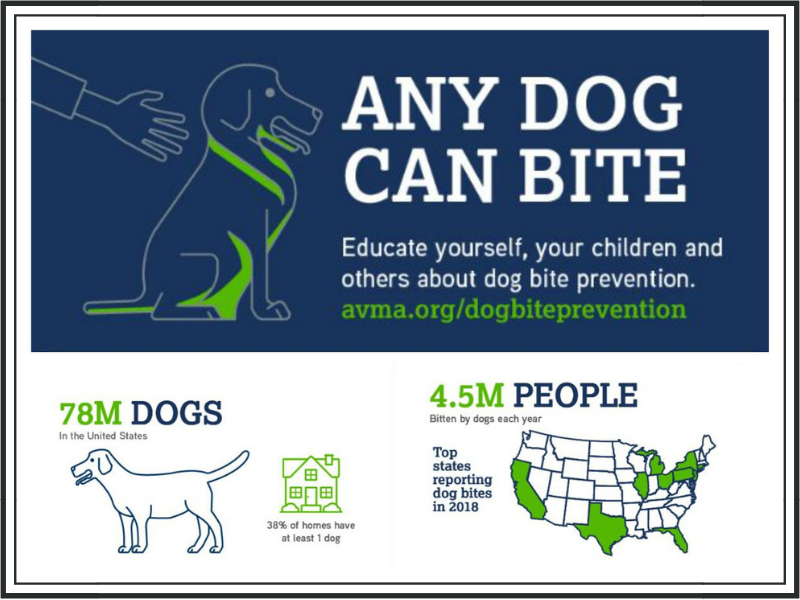 To learn more about dog bite prevention, click here. Older PostMy cat just ate a Lily leaf…now what?